Two Vietnamese researchers on November 16 were awarded the 2017 Newton Prize Vietnam for their project “Building a Foundation for Sustainable Development: Networked Societies for the Cities of Tomorrow” that addresses communicating during disasters. Dr. Trung Duong from the School of Electronics at Queen’s University Belfast, the UK and Dr Vo Nguyen-Son from the Faculty of Electrical and Electronics Engineering at Duy Tan University, Vietnam received 200,000 GBP prize money for their breakthrough – an integrated heterogeneous wireless system capable of transmitting during extreme weather conditions, such as earthquakes, tsunamis or hurricanes. 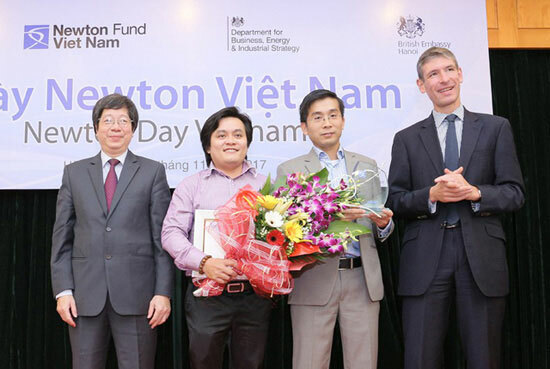 The award was announced at a ceremony in Hanoi to celebrate the Newton Programme Vietnam, a collaborative development programme for science and innovation between the governments of UK and Vietnam launched in 2014. The programme aims to boost socio-economic development via science and innovation in Vietnam. It offers funding opportunities for both Vietnamese and UK scientists, researchers and other stakeholders including science managers and innovative businesses. It focuses on Vietnam’s prioritised areas – health and life sciences, agriculture, environment and energy, future cities and digital innovation and creativity. Activities focus on research capacity-building and fellowships, collaborative research projects on development challenges and translation, with training and partnerships to turn research into practical applications and development solutions. Speaking at the ceremony, Deputy Minister of Science and Technology Tran Quoc Khanh said the two countries have provided funding for five joint research projects, about 2 million GBP from the Newton Programme and 20 billion VND (880,000 USD) from the Ministry of Science and Technology, since the programme was launched three years ago. Khanh hoped that under the programme, Vietnam and the UK will step up collaborative research in areas of mutual interest and foster innovative research, helping strengthen the two nations’ partnership and cooperation in science and technology./.